Travel north from Brisbane along the Bruce Highway. Just after the iridescent and other-worldly Glasshouse Mountains, veer off into the beautiful hinterland and before long you’ll come to a crossroads. The oft-travelled left turn will take you towards picturesque Maleny, which, with its art –galleries and arts-and-craft shops is a magnet for tourists. But turn right, and you’ll enter Montville, one of the most charming – and underrated – towns in the region. When you’ve finished eating, wander along Main Street and take in some truly unique shopping. You’ll find everything from genuine Venetian masks at the Italian Shop to some of the finest handmade chocolate in Australia at Chocolate Country. In fact, Montville is famous for being home to a range of international specialty shops, where you can pick up a whole host of treats and rarities, including Bavarian clocks, South African shoes, Scottish pendants and Irish whiskey. And don’t miss out on the world-class art galleries that showcase local artists and regularly host exhibitions. 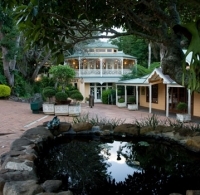 The Montville Art Gallery is just one of many that you should check out when you visit this beautiful little part of the world. But now you’re here, you’ll want to stay awhile, and here’s where Montville truly comes into the realm of ‘bucket list’ destinations. 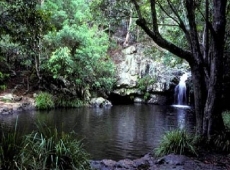 Just 200 metres from Main Street, along the aptly named Narrows Road, lies one of the best-kept secrets not just in Queensland, but possibly all of Australia. Secrets on the Lake is, quite simply, paradise found. Nestled by the northern shore of Lake Baroon, Secrets is the ultimate romantic getaway. Ten individually themed tree houses have been built with such exquisite attention to detail that they manage to distract from the jaw-dropping beauty that surrounds them. The genius of the design and location means that each tree house offers perfect seclusion – you feel it’s just nature and you. Your home away from home includes a sunken spa bath, a massive deck overlooking the rainforest and gorgeous lake, an HD LCD TV, sound system, iPod/iPhone speaker, hand-carved king-size beds, a genuine log fire, air conditioning, and romantic outdoor swing-seats. Take a stroll through hand-crafted elevated walkways tens of metres up amongst the rainforest at eye level with the stunning local flora and fauna, or take a canoe ride across the tranquil, sun-dappled lake. The feeling of seclusion is like nothing you have experienced before – you’ll be hard pushed to bump into anyone else within the huge, lush private retreat. Owners George and Aldy Johnston have dedicated years to the sole strategy of making Secrets on the Lake the best resort of its type in the country. Everything they’ve learned through the experience of running the resort they have put back into it. They are constantly improving the experience for their guests, always taking on feedback and acting upon it, and in so doing have created the perfect retreat.